The Pantone Colour of the Year for 2015, 18-1438 Marsala, is a naturally robust and earthy wine red, that enriches ones mind, body and soul. Pantone 18-1438 Marsala is a subtly seductive shade that draws us in to its embracing warmth. Nurturing and fulfilling, Marsala is a natural fit for the kitchen, dining room or for linens throughout the home. This hearty, yet stylish tone, is universally appealing and translates easily to fashion, beauty, industrial design, home furnishings, graphics projects or interiors. Add elegance to any room by incorporating this rich and welcoming tint in accent pieces, accessories and paint. Pantone Marsala’s plush characteristics are enhanced when the colour is applied to textured surfaces, making it an ideal choice for rugs and upholstered living room furniture. 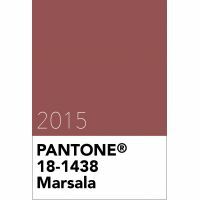 Pantone 18-1438 Marsala is from the Pantone Fashion, Home + Interiors colour library.